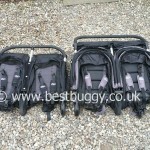 These photographs of the 2011 Baby Jogger City Mini Double and the Baby Jogger City Elite Double should largely speak for themselves. 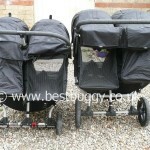 The Baby Jogger City Mini Double is basically the little brother of the City Elite Double. 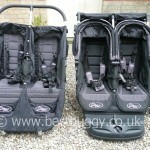 There are huge similarities (eg seats, recline, storage, huge hoods, the amazing easy fold mechanism) but also a lot of differences. 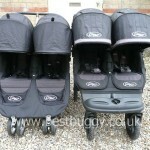 There is no doubt that there are much better features on the Elite such as the raised kicker boards, very padded seats, larger hoods, handbrake, easier access to the storage , adjustable handlebar, magnetic peekaboo windows, side air vents, amazing parent consoles and of course the bigger ‘Forever Air’ tyres with good suspension. 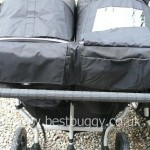 However the trade off is the larger fold and heavier pushchair. 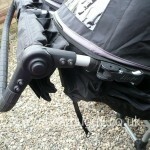 But to be honest I think the extra features on the Elite outweigh the fold & weight negatives. 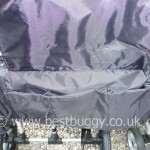 The City Mini has in Mr BB’s words “a shopping trolley” feel when you push it ie it wiggles from side to side ever so slightly, but the Elite drives in a straight line. 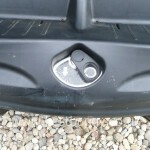 However the Elite is also heavier and harder to turn on the spot. 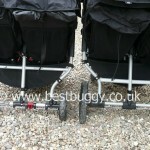 Both pushchairs can be pushed one handed but the Elite is a little heavier. 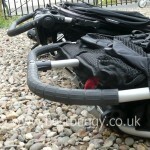 I love the Elite’s adjustable handlebar because the City Mini handlebar was at just the wrong height for me at 5ft 6ins. 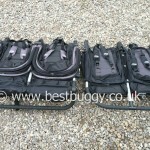 The storage on the Baby Jogger pushchairs is fantastic including large storage baskets and net storage pockets on the back of the seats. 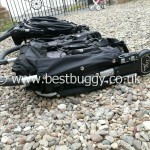 But the Elite goes even further and there are huge amazing parent consoles on the handlebars for all those bits & pieces eg purse, keys, phone, camera, snacks and drinks. 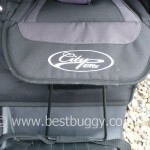 When we shopped with the City Mini, every item had to be pushed into the basket individually, and then fished out again individually once we arrived home, which quite frankly was annoying. 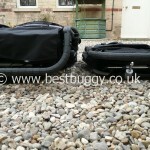 But it was easy to simply push a whole bag of shopping into the Elite storage basket either from the back, (because the bar across the back is much lower,) or through the access hole under the kicker board. 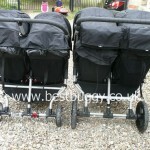 However the advantages of the Baby Jogger City Mini are the weight, slightly smaller fold and cost. 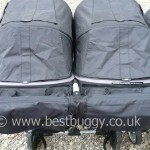 The City Mini Double 2011 also has the “upright” strap which makes a huge difference to how upright the children can sit, and also the City Mini 2011 can take two carrycots. 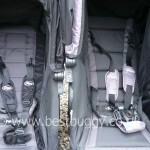 Hopefully the Double Elite will soon have these improvements too which will give it a better competitive edge against its main rivals. 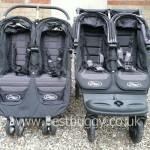 So the City Elite and City Mini are two very similar, but yet different pushchairs. 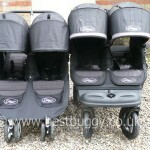 Which would I choose? 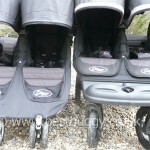 No doubt it would be the Baby Jogger City Elite. 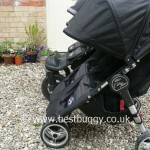 The size is very similar, the fold minus wheels (which simply pop off) is not much different to the City Mini, but the level of luxury and comfort for both children and adult is much much greater. 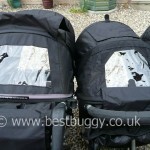 But ultimately, these two double pushchairs are two of the very best on the market at present, and both are highly recommended for features and child comfort. 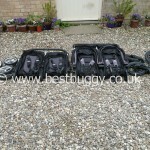 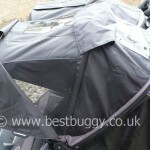 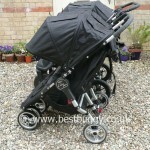 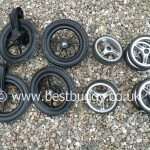 Many Thanks to Kooltrade (UK Baby Jogger Distributors) who kindly provided the Elite for Best Buggy to review.